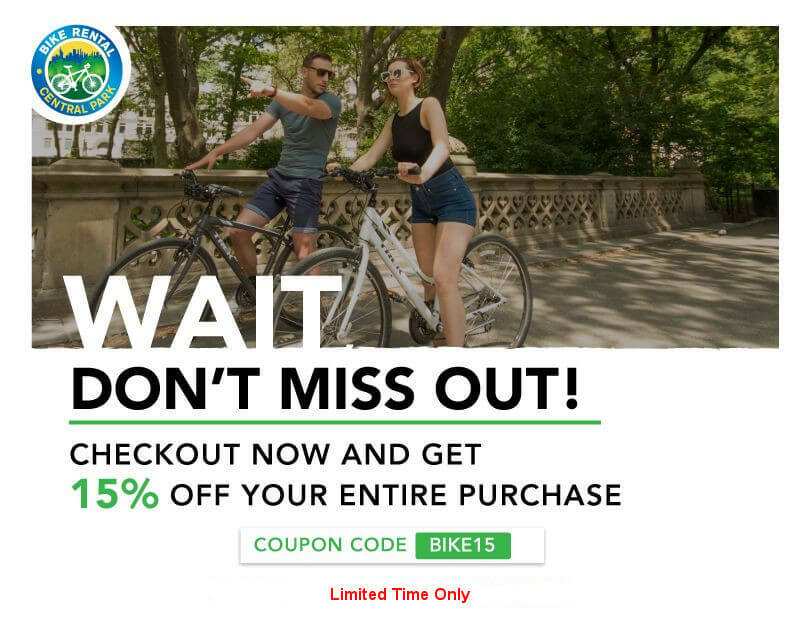 At Bike Rental Central Park™, we work hard to offer the best Central Park sightseeing experience possible for NYC tourists and local New Yorkers. For more than a decade, we've provided top-rated equipment and expert NYC tour guides to our customers who want to explore the park and the rest of New York City, and today, we feature the largest privately owned bike fleet in the city, including more than 1,000 Trek bikes, all of them professionally maintained. We've served scores of satisfied customers, and received great ratings on Google and TripAdvisor. Take a tour with one of our expert guides and you'll see for yourself that their local knowledge of New York City is second to none! Bike Rental Central Park™ has three prime locations close to Central Park, and we offer all-inclusive bike rental packages that include a bike, helmet, map, and bike lock at no additional charge. We carry all sizes and types and can fit you with the right bicycle. Whether you want to enjoy a ride on a tandem or comfort bike or conquer the park on a mountain bike, we have the right ride for you. With the help of Bike Rental Central Park™, Columbus Circle, the park, Manhattan, and beyond are within easy reach! Want more adventure after your bike tour? Manhattan can be experienced on one of our Liberty Cruises or with a Night Bus Tour, too. Save when you purchase a combo ticket and look at New York City in a whole new way! Only have an hour or two? No problem. Opt for a short one-hour bike ride. Have all the time in the world? Explore NYC at your leisure with an all-day bike rental. The Upper West Side and Upper East Side around Central Park have plenty of trendy boutiques, eateries, and storefronts to check out. Stop in for a souvenir or a bite before pedaling off! We are open year-round, so you can rent bikes or return them at your convenience. We can also deliver bikes to many local hotels, allowing you to just call for a bike and start right away on your Manhattan bike tour. Alternatively, you can visit us and use the lockers at our location before you set out. At Bike Rental Central Park™, Columbus Circle can be the starting point of one of the best and easiest tours you will find in NYC. Reserve a ride through our site and join us as we discover this fantastic city. With Bike Rental Central Park™ at your side, there's no need to ask, "Where is the best deal for a bike rental in NYC near me?" The answer is right at your fingertips: Book today and save.